Spending on online advertising is expected to outstrip print advertising this year. Last year U.S. businesses spent $39.5 billion on internet advertising, according to eMarketer, a figure that is expected to double over the next 5 years. 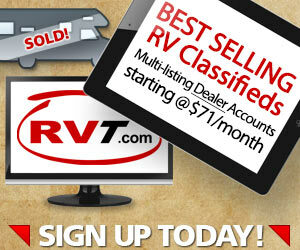 Market-savvy RV dealers are moving their advertising online where 85% of shoppers now begin their search for a new vehicle. Well-designed online display and banner ads have proven effective in building RV dealer brand recognition and driving traffic to dealer websites and online inventory — and therein lays the problem. Poorly-designed ads don’t register with site users, netting little return on investment. Attract Attention. 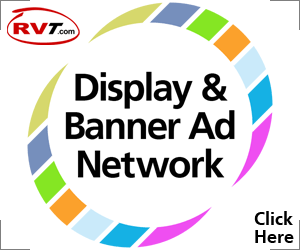 Banner and display ads have only seconds to attract the attention of browsing shoppers. Your message must be understandable at a glace; in other words, short, sweet and boldly presented. Advertisers use the following elements to attract attention. Color is the most effective attractant. Bright, bold colors attract the eye. Use high-contrasting dark blues and greens in headlines and bright reds and yellows for emphasis. Size matters. To stand out, ads must be larger and feature larger, bolder headlines and photos than surrounding material. Shape is trumped by size. Rectangular and horizontal ads attract more attention than square or vertical ads; but bigger is better! Motion can be distracting and annoying and should only be used in small amounts, if at all. Position ads at natural entry and exit points on the page or in text for greatest impact. Text should be short and easy to read. Black type on a white background is the easiest to read. Engage interest. Site users stop and read ads that seem relevant to their lives. Establish relevance by focusing ads on a single major need or emotional desire shared by your target demographic. Don’t weigh display and banner ads down with boring gray text; leave details for your website. In headlines and images, appeal to the emotional reasons for buying an RV: freedom, nature, family values, inexpensive travel and healthy lifestyle. 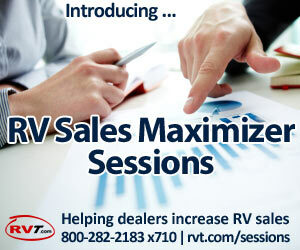 Use photos to convey RV values and relate to your target demographic. For example, convey nature, healthy lifestyle and family togetherness with a photo of a family of four biking past an RV on a wooded campsite. Call to action. ALWAYS include a call to action in ad and make it bright and bold so shoppers know exactly what you want them to do. A call to action must be easily recognized and understood. Use size and color to direct shoppers’ actions. If you want them to click on your ad, prominently display a large red button that says “CLICK NOW.” If you want shoppers to follow a link, bold the type and underline it in blue. But telling shoppers what to do is only half the battle; your ad must also compel them to act. Entice shoppers to click with offers for discount coupons, coupon codes or free information downloads such as RV buying guides, travel tips and local campground directories.